Finally! It is here and I’m delighted to be able to share it with you. 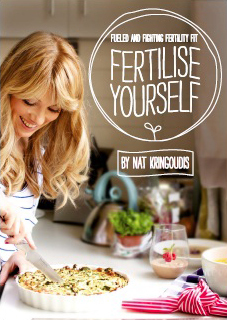 ‘Fertilise Yourself‘ isn’t limited to only those wanting to get their body fit and raring for babies. It’s about overall wellness, because lets face it, fertility is an extension of your health, not limited to babies. Best of all, the recipes I include in the book will help everybody move toward their healthy weight. It’s also ideal for pregnant and feeing mothers. Everybody wins! Want to hear a little more – watch away… I want to share with a little clip from our launch on Tuesday. And finally – a few more thank-you’s. Beautiful images from CJ Photography (let it be known, the ‘average’ photos are taken by me – you can tell CJ’s work from mine – they are stunning). Like the design? Me too! Thank you to the girls at Sea Thru Studio for hours of work and delivering me a book I’m so proud to share. I also wish to thank Sarah Wilson (she ever so kindly wrote the foreword), Jo Foster, Ian MacWilliams, my Pagoda Tree team (Amy & Lucy), My Family (Chris and the kids) and Rebecca O’Riley for helping me launch this baby. Stay tuned for some awesome prizes and be sure to spread the word, if you love ‘Fertilise Yourself’ I’d love you to tell everybody they can grab it here. Ԝow, marveloսs weblog format! How lengthy have you been blogging for? web site іs excellent, let alone the сontent!